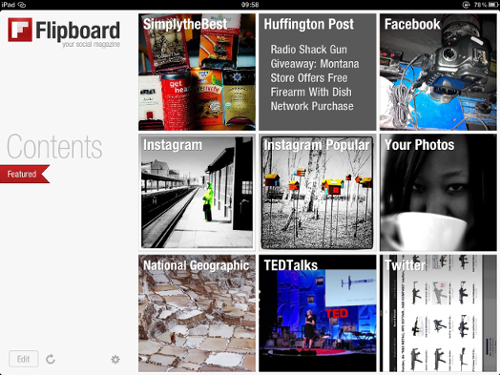 Luckily I discovered one elegant and appealing way to browse Instagram by adding my feeds of choice to Flipboard. Flipboard was on the Best-Apps-of-2010 list of many people. It’s an app that has to be experienced firsthand to be believed. There’s definitely an ooh-aahh reaction at least on the first use. It’s essentially a one-stop shop for all social media or news feeds (twitter, facebook, google reader, flickr) and done effortlessly and beautifully. It’s definitely an app to show off to the non-iPad believers left in the world – it’s that good. 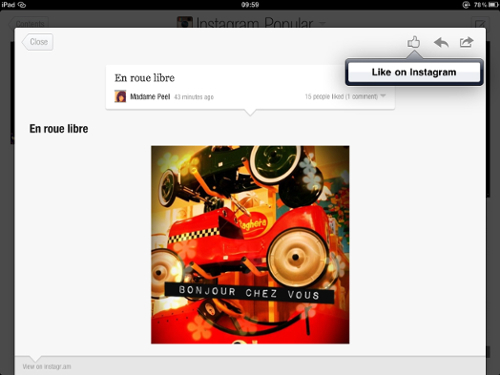 Browsing Instagram on Flipboard almost beats the real thing, but only almost (more on that in a bit). The images take centre stage, arranged in a tasteful mosaic, which allows for quick browsing. 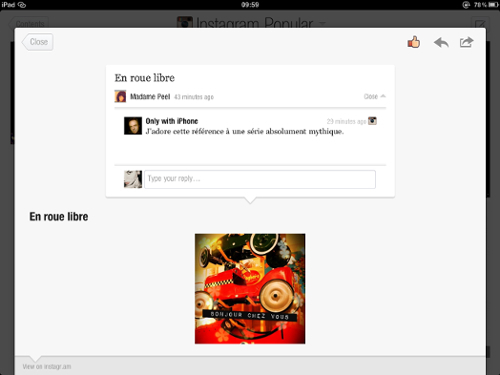 Stop to focus on one image and you can view user profile, like, comment, share or click on a red-coloured tag to discover more similar images. Flipboard even lets you keep the search as a separate feed e.g. choosing the tag #trail lets you save this feed of its own accord. The only very minor drag is that touching the “like” icon doesn’t directly “like” but prompts you to confirm “like on Instagram”. Still, very nicely done. Easily my favourite way to spend downtime after a hard day’s work. Oh, and it’s free. 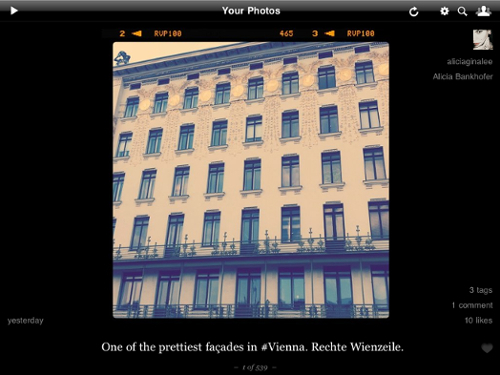 Another alternative is the iPad app Instagallery (iTunes link), which aims to present an Instagram full-fledged gallery. The images are full screen, to fit either portrait or landscape, viewed against a darker or lighter background. You can view your feed, popular or your photos, either manually or via a slideshow, which some will find useful but it’s not something I tend to use. You can also refresh all feeds or search users and tags. On the right of each image there’s info on tags, comments and likes which you can click on to (as you can imagine) tag, comment or like. As can be expected there is endless browsing – click on a user, view his/her feed, click on a tag, well you get the picture (quite literally!) 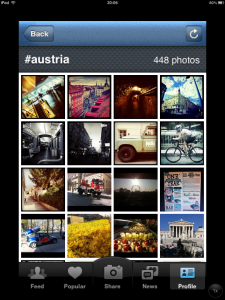 While it is well done, Instagallery does not match the pleasurable experience of flipping through Instagram with Flipboard. And it costs €1,59/$1.99. Still, a surprising alternative for Instagram is the iPhone app itself, which I installed solely to be able to post images from the iPad directly. Even though the app’s interface is not made-for-iPad, what really surprised me is that the quality of the images, blown up for the iPad screen does not noticeably suffer. I’m sure purists will beg to differ but for the casual user, the images are nice enough for their iPad closeup. 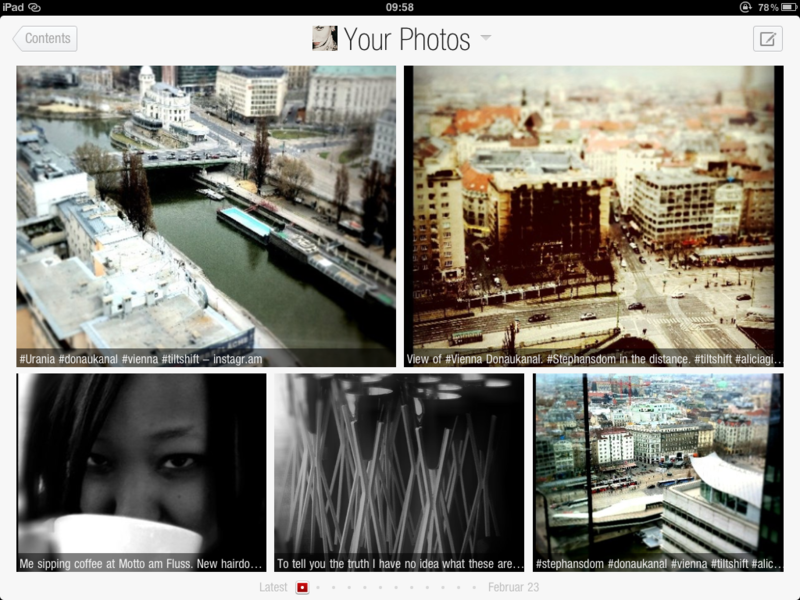 Who knows, perhaps the makers of Instagram will bring out an iPad version soon so we can have an even better experience. Hopefully for free. My verdict? Flipboard wins hands down. The only thing missing is a way to post to Instagram, which is not part of its raison d’être so this won’t change anytime soon. Instagallery is nice but not really in the wow category and Instagram for iPhone does its job of posting pics with or without filters to the community, imperfect for browsing. That’s what we have now, but I’m sure we’ll see many more apps in the near future, built to let us share and enjoy images Instagram-style, for the iPad. 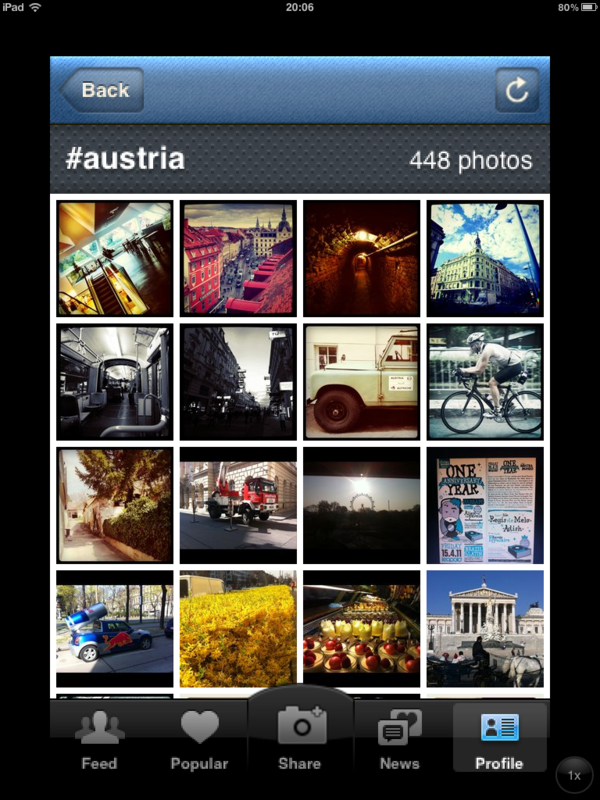 Instagallery was independently purchased by the post author in the iPhone App Store. For further information regarding our site’s review policies, please see the “About” page. can you also make an acount on your ipad? ?